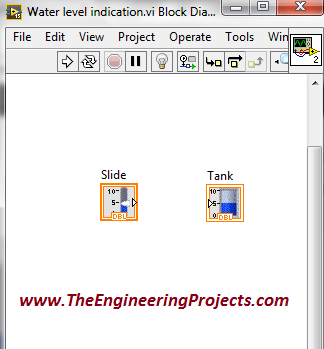 A complete step by step tutorial on Water Level Detector in LabVIEW. Hello friends! Hope you all will be absolutely fine. 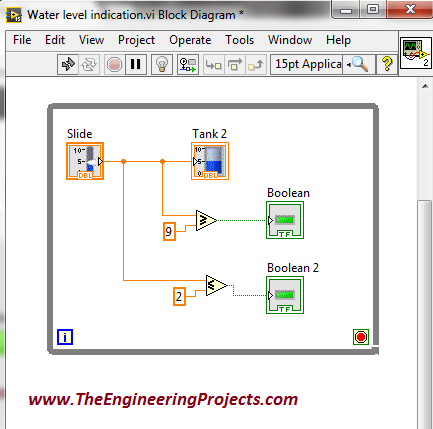 Today I am going to share my knowledge with you about how to create an algorithm for Water Level Detector in LabVIEW 2015. 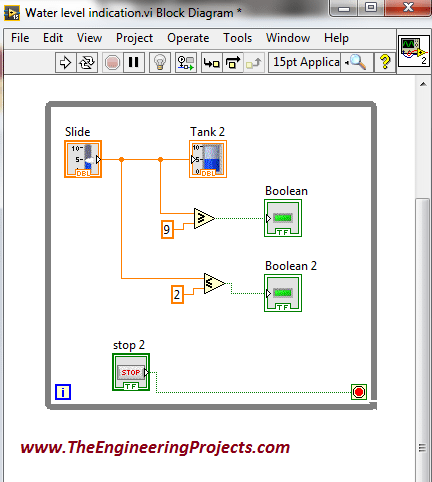 LabVIEW is an excellent software for simulation purpose as well as for the hardware interfacing (interfacing with the external devices). I support the “Graphical Language” which is usually known as “Field Programmable Gate Array (FPGA) ” based language. In other software we have to create logic first and then we need to write a complete syntax for the created logic. 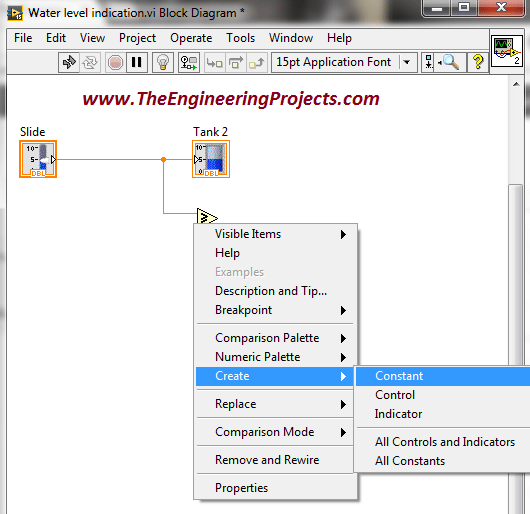 This software is very easy to use and is quite helpful. 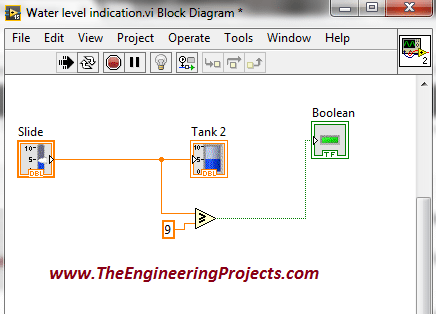 Because, we don’t have to write the complete complex syntax, instead we have to just create our logic and implement this logic using FPGA blocks. 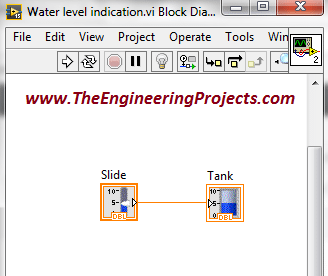 In this tutorial we will learn to make a simple water level detector in LabView. 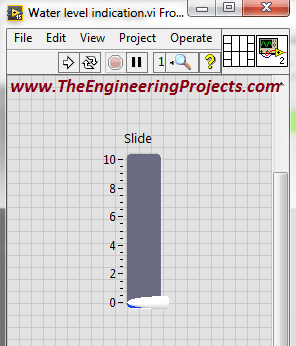 The simulation is given below for download and if you guys have any problem in it then ask in comments and I will resolve them. 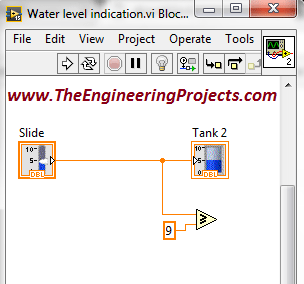 This simulation is tested on LabView 2015. 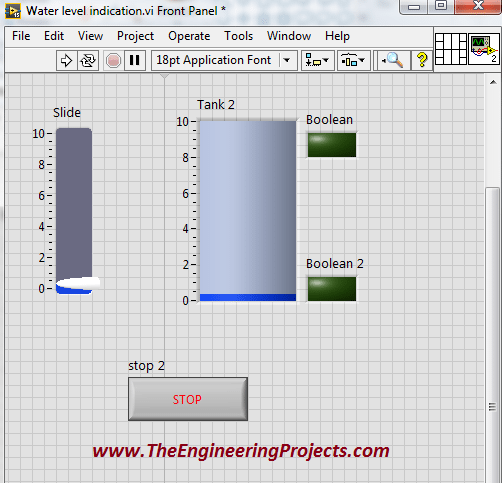 Vertical pointer is used to control the level of the water in the tank. 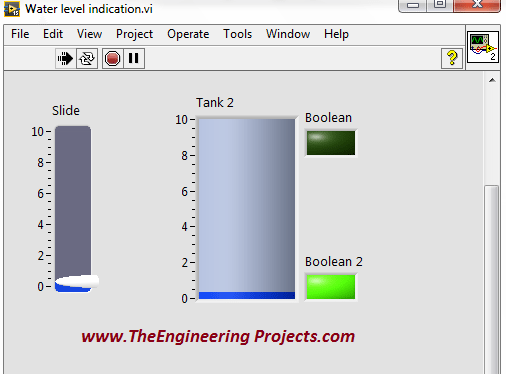 Upper level indicator shows when the tank is about to completely fill. 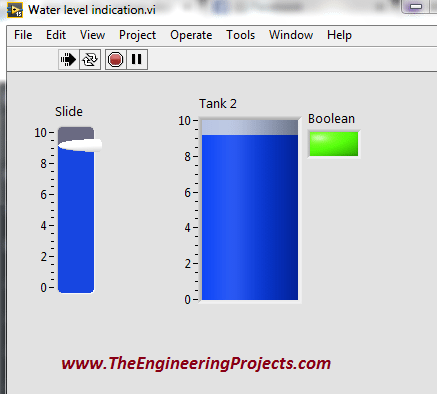 Lower level indicator shows indication by turning “ON” the LED when the level of the water in the tank is too low and we need to fill it. 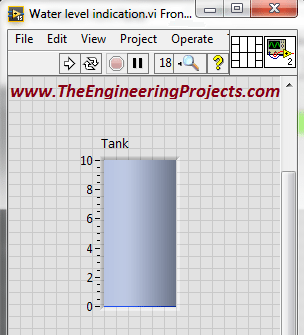 Graphs shows the graphical visualization as the vertical pointer moves up ow down. 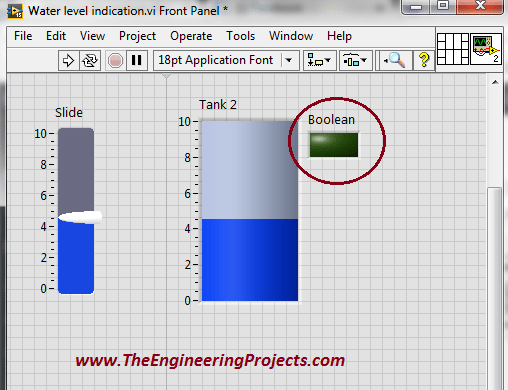 Go to the “Front Panel” and press “Right Click” from your personal computer or laptop. 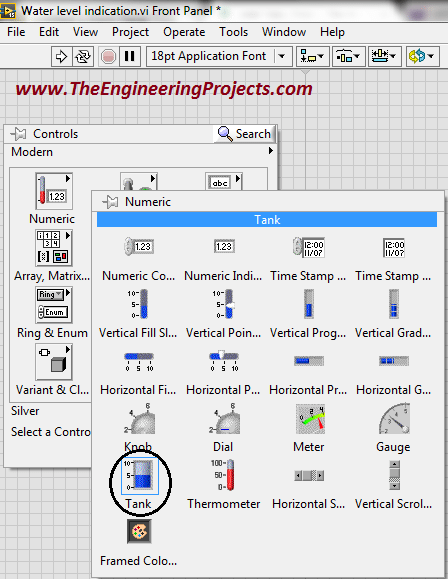 Now, go to the Controls-> Modern-> Numeric-> Tank. By doing this, you can see the following figure in your PC’s screen. 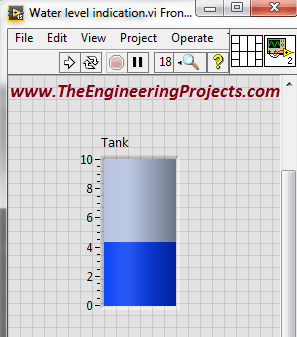 Blue color show the level of the water in the tank. 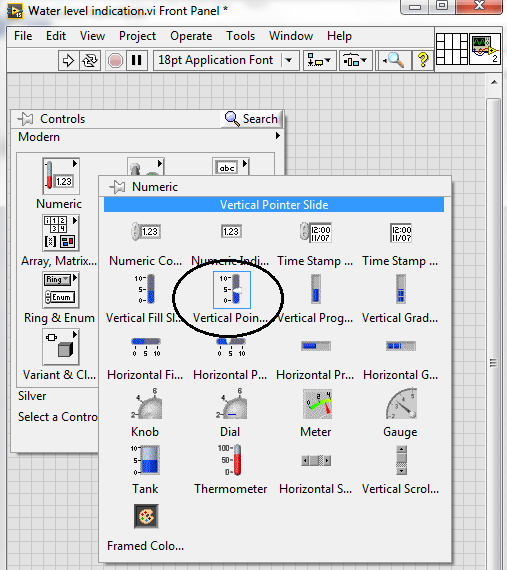 Now go to the “Front Panel” and then go to the Controls-> Modern-> Numeric-> Vertical Pointer. You can see different blocks in the above figure. 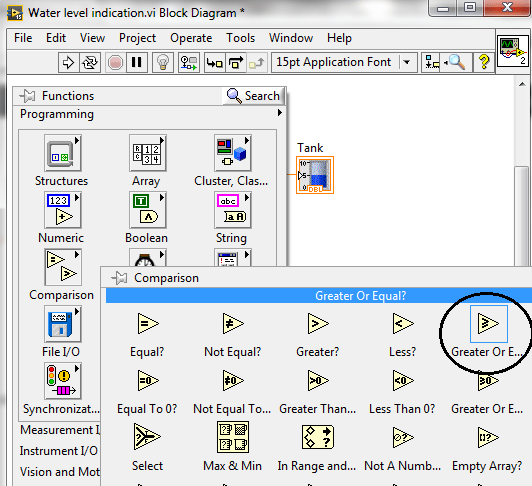 Select the encircled block i.e. 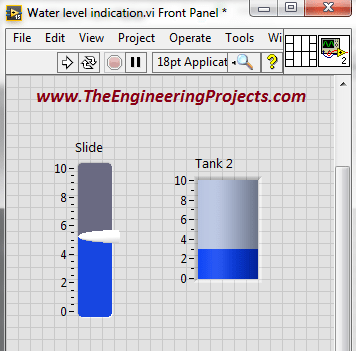 “Vertical Pointer”. Place this block on the “Front Panel”. 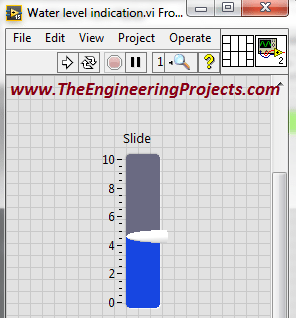 Put the “Cursor” on the “Vertical Pointer”, press click and then move up and down. Go to the Functions-> Programming-> Comparison-> Greater or Equal? As the upper limit is adjusted above. Similarly set the lower limit. Go to Functions-> Programming-> Comparison-> Less or Equal. 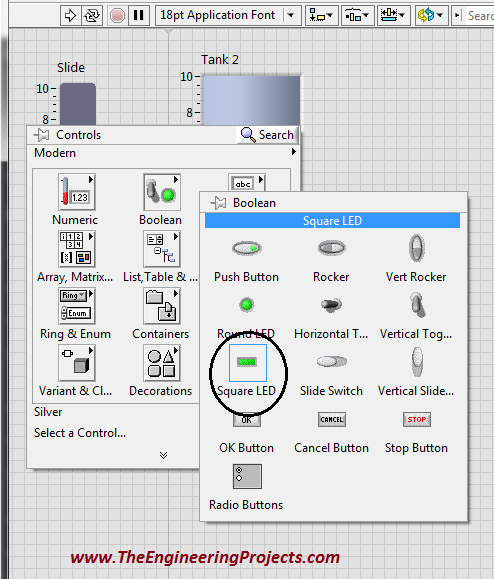 select this block and connects one of its inputs to the “Vertical Pointer”. Go to the second input and press “Right Click”.